Located about half way between Brandon and Lakeland, Plant City Florida is known as the winter strawberry capital of the world, and hosts the annual Florida Strawberry Festival in the late winter, usually around February or March. Residents of Plant City may venture to Downtown Tampa or Ybor City for nightlife and entertainment, but there are still plenty of local bars & restaurants in Plant City. 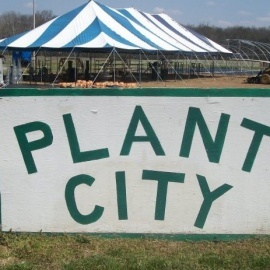 There are also several attractions and things to do in Plant City. Dinosaur World and Pioneer Heritage Museum are a couple of the most popular places to go. If you are looking for a suburb of Tampa that is conveniently located to both the Tampa and Orlando then Plant City might be a great option for you. Check out the Jobs and Real Estate sections if you are planning to move to the area. Tampa is tipping off the weekend with awesome things to do for all fun-seekers! Winning is always satisfying and fun, and so is pizza. Logically, winning something by eating a lot of pizza would be double the fun, right? Admission is $5 per person (kids under 12 are free) Free Parking Sorry No Pets, Scooter Rentals available, Food For Purchase, ATM onsite. Classix Rocks O'Brien's Plant City ! Nothing like a pre-Cinco De Mayo party! Classix loves this place! Great food, drinks and Awesome staff! C'mon out and party with us! Classix is ready to set this place on fire! Come on out and help us Light it up! April Red LIVE at The Caribbean Bay Bar in Winter Haven! We love the atmosphere at this Awesome little venue with a Massive Tiki Hut over the water!! April Red ROCKS the TIKI at Caribbean Bay in Winter Haven! April Red is so excited to be Rockin' the Tiki at The Caribbean Bay Bar in Winter Haven!! We love the atmosphere at this Awesome little venue with a Massive Tiki Hut over the water!! As a legit and specialist FIFA 19 Coins seller, U4GM will guide you how you can choose a trustworthy FUT Coins internet site.